Louis Van Gaal praised the character of his young players after a largely inexperienced Manchester United side beat Midtjylland 5-1 on Thursday night to book themselves a place in the draw for the Europa League round of 16 after winning the tie 6-3 on aggregate. Anthony Martial was the latest United player to suffer an injury, as he complained of a hamstring problem during the warm-up, but the Frenchman was brilliantly replaced by Marcus Rashford, who scored twice on debut to swing the tie his side’s way. Van Gaal has been rightly criticised for a number of reasons this season but his decision to promote youngsters into the first team, Guillermo Varela played at right-back for his sixth appearance while Joe Riley made his first start at left-back, is surely to be admired. The club planned poorly for time after Ferguson, it appears that both Ferguson and Gil only communicated their intent of stopping in the spring, giving the club no time at all to prepare for the next phase. It should have been prepared for the last 5 years. Building a new generation is a bit of an exaggeration. Only Lingard has broken through and only at the expense of Januzaj. McNair, Blackett and Wilson were promoted to the first team last season enjoying several appearances but have barely featured this season with the latter two farmed out on loan. Varela and Borthwick-Johnson have had several appearances but I doubt they’ll get much further gametime once Valencia and Shaw are back from injury. 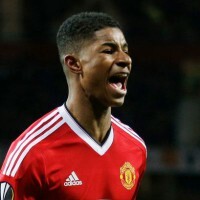 As for Rashford naturally the press are lauding him as the second coming of Rooney but sadly the odds make it more likely he’ll go the same way as Macheda. It is also hard for youngsters to break through when we are signing half a dozen expensive players every summer and really struggling to finish in the top four. It is not enough to want to promote youth you also need to be able to win games to please the fans and make the club commercially viable. LVG’s failure in that respect despite massive financial backing creates the very real danger that this generation of youngsters is doomed. And don’t blame the injury crisis because without that his record on youth development would be even more spotty. @colver: But surely our record on the pitch would be a lot better if we didn’t have so many injuries? i think he’s putting in a decent effort with what he’s got personally, don’t particularly like the guy but fair play to him for showing a bit of class in difficult times.